Things are really heating up on the Hook this week! Our latest giveaway has arrived and I'm super excited to make some new friends and welcome back those of you who have been here before. Thanks again to Kathy for this awesome hop. 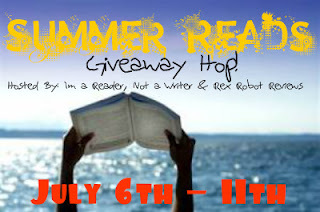 http://iamareadernotawriter.blogspot.com/2012/05/summer-reads-giveaway-hop-sign-ups.html. My favorite summer memory was going to the creek every week to swim with my cousins. We looked forward to Wednesday every week!! My favorite summer memory is driving up to Vermont with my best friends and hanging out around a bonfire until 3 AM. Then, when we decide to leave, we lay in a patch of grass that only we know where it is and stare at the stars until we're about to pass out and have to head back to our cabins. Santa Cruz beach body surfing! I loved bringing my puppy swimming. He always made me laugh. My favorite summer memory was playing in the mud along the marshes with my best friend. You guys blow me away with all of your beautiful memories! Thanks to those who took a moment to share. Good luck to everyone! Here's to creating new, sweet summer days to remember forever.